Couples, families, groups and solo travelers who want good value in the Central Valley area. With a great location and well-equipped rooms, this Holiday Inn in Escazú is a good brand hotel among several options to rest while enjoying on-site amenities near San José downtown. Nearby city life. The area is full of shopping malls and restaurants. Accessibility. The hotel is easily accessible via car and public transportation. On-site amenities. Holiday Inn Escazú offers a variety of on-site services for your convenience. Boutique feel. The hotel meets the standards of its brand. Extreme luxury. Your basics are covered and the rooms are comfortable but don’t expect any extravagancies. Views of nature. The hotel is located in a busy plaza with frequent traffic. 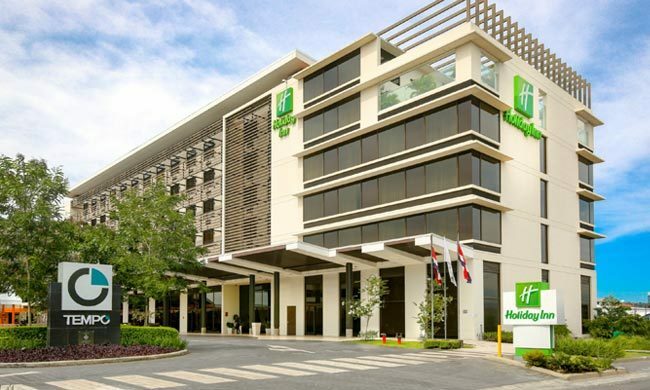 Close to shopping centers and the city, this Holiday Inn in San José is a good stop upon your arrival or prior to your departure from Costa Rica. Conveniently located 30 minutes away from the San Jose International Airport, the Holiday Inn Escazú offers a comfortable experience in the Central Valley. It’s also great for those who want to experience one of Costa Rica’s most bustling shopping areas and some of the advantages the city has to offer. The hotel itself offers the modern comforts of the Holiday Inn brand. With their service and attention, the experience at this location has the benefits of the city that surrounds it. Located in one of the main roads in the country, it has easy access to all the routes that go to Costa Rica’s most popular areas, like the Pacific coast, Arenal Volcano and the airport. Rooms at Holiday Inn have sleek designs with little decorations to provide an unobtrusive environment. It’s ideal to relax and rest after a day of traveling or right before leaving the country. Relax here in a well-appointed space while watching TV or chatting with your travel companions. If you are in search of something more active, the hotel also has several on-site amenities for you to enjoy. Hit the open-ceiling pool to lounge and swim on the top of the building, admiring the city far away. Or if you want to keep your fitness routine on track, go to the exercise room by the pool and take advantage of the hotel’s machines. There’s a chance to use the treadmills, an elliptical, free weights, a yoga mat, and an exercise ball. Fogo Restaurant is also located on-site, and it’s open for all three meals of the day. It offers both international and local cuisines with a la carte menus. The bar, Aqua, has a variety of cocktails, drinks, and a wine list you can choose from. Sit back in a stool, and relax while watching the view from the large glass windows that let the light in. If you have business to tend to, the business center is also available for any meetings or calls that need to be made. The lobby even has a PC with printer in case there’s an important document to keep at hand. Although the hotel is a good place to rest your head after a busy day, its greatest asset is its location. The plaza that surrounds Holiday Inn has a variety of restaurants, bars, ice cream shops, supermarkets, and other stores to visit. Go exploring for souvenirs, entertainment or different cuisines to satisfy your cravings. Whether you want a quick bite with the kids or a romantic dinner, the variety around Holiday Inn is ready to cover it. Beyond the hotel’s grounds, there’s plenty to do as well. Escazú is one of the best business areas of San José, and this Holiday Inn in San José offers scheduled shuttles to the biggest shopping malls. Take a complimentary ride to Multiplaza Escazú to shop and spend an idle day, or head to Plaza Itzkatzu and Avenida Escazú for gastronomic choices and boutique stores. There are also movie theatres, discotheques, and places to stack up on essentials. If you wanted to explore San José downtown, that’s also possible. There are museums, tours, and other cultural experiences you can tackle. With a friendly staff, comfortable rooms, and plenty to do in and outside the property, Holiday Inn Escazú is definitely one of the best options out there for a quick stop in the Central Valley area. If you feel like this is the hotel for your Costa Rica Vacation, contact us and we’ll gladly answer any of your questions and help get your trip started.